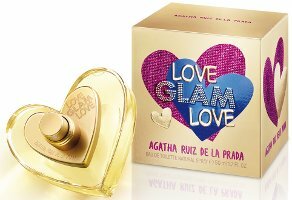 Spanish designer Agatha Ruiz de la Prada has launched Love Glam Love, a new fragrance for 'glamorous girls who are in love with love'. Love Glam Love is a flanker to 2011's Love Love Love and follows 2013's Love Forever Love. Notes for the floriental fragrance include bergamot, raspberry, pear, jasmine, orange, rose, heliotrope, benzoin and patchouli. Agatha Ruiz de la Prada Love Glam Love is available in 50 and 80 ml Eau de Toilette. Eight year olds around the world squeee in excitement. Or not …. okay, I haven’t smelled it…or its predecessors so I should keep my mouth shut. But please allow me just a little eye rolling. yes, I knew a moment of fear and disappointment as well. From other imagery they’ve associated with this scent, assuming it’s meant for ‘tweens.